We have only included alien species which are confirmed to be sentient, according to the definition provided within the Star Wars universe. Animals such as the Rancor or Tauntaun are therefore excluded while the Dianoga is included as they are considered sentient in the modern canon. What is your favourite alien species from Star Wars? Let us know in the comments. Teedo is also the name of the species? Talk about a dog named Dog. Kel Dor (Plo Koon). A unique mould is a requirement for a good representation of a species in my opinion. I'm hoping for a specialized mould for a Sullustan species to be released in the future. Thanks for this! Pretty cool to see how many there have been. One note: you have Moroff listed twice under two different species names: Gigoran and Grindalid. I'm guessing you meant Moloch for the Grindalid. I don't think I ever really stopped to appreciate just how many aliens LEGO Star Wars has given us, probably 'cause most species start and stop at one member. Great timing! I just started this collection. Thanks! @Golem25 and @TeaWeevil - Thanks. That has been corrected. @MCLegoboy - Kowokian Monkey-Lizards are non-sentient and semi-sentient creatures, including the Rancor, are not included. I have not separated male and female characters, although some differ quite considerably as you mention. Not at all a correction, more a point of discussion. Although I think Maul was a Zabrak, but I read something about the males taken to Dathomir being referred to as Dathomirian because the Night Sisters changed them. Maybe that’s what made their skin change colors. Can’t remember. Can we get more Ithorians please!? I need an army to make an ithorian compound moc from kotor 2! @nashikens and @MCLegoboy - I did consider separating Iridonian and Dathomirian Zabraks but they are both subspecies of Zabrak and including subspecies has the potential to confuse matters. Thank you for the suggestion though. Excellent article. The real question is how many more need to be made to get them all! So at least one new species per year. Interesting! Just got to be the Ewok. @CapnRex101 But Asajj Ventress is Dathomirian, not a Zabrak, I was glad that he brought up Dathomir because I went looking and Dathomirian was missing from the list. Speaking of Max Rebo's species, Ortolan, Disney retconned them so they no longer have arms, just a trunk and two legs. *grumble* I can't dispute official canon. 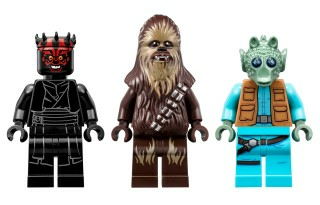 Wow, did not realize there was no Neimoidian minifigure until as late as 2009. I would certainly like to see an Aqualish minifigure though. Star Wars really does have - hands down - the best range of aliens in any sci-fi fandom. All so diverse and recognizable, and yet they all have that Star Wars feel to them. Also, @Pekingduckman W H A T T H E H E L L I S T H A T ? That's why I love brickset. Because you guys can and do post such articles that enhance our overall LEGO involvement (regarding SW in this occasion). And by reading this article, I am in the verge of abandon my promise (to obviously myself and my wallet) to refrain from buying licensed sets and start collecting all those separate species... Ghaaaaa! P.S: IS it possible for one of our esteemed readers to create a brickset list with all the above characters? I don't know about in star wars but in the real world classification, dog cats etc are all sentient but humans are sapient. Trandoshan! Bossk rules! A lizard in a yellow flight suit- too cool! Interesting list, but most of these probably weren't even referred to by name in the movies, never mind species. When did it become necessary to give every minor background character their own back story? Seems a very "Star Wars" thing too, I can't think of any other series/franchise that does this. I guess a lot of it stems from the extended universe stuff like games/comics etc. Angry/Sick Clones: Clones and StormTroopers. Awesome lists. Great list, loved It! Just to add something, you may also include B'Omarr Monks since they're sentient beings (not sure if they're classified as a race though). Wookiees all the way. So iconic, from the first cute looking Chewie and the generic Wookiee Warrior to the more recent, really scary looking ones. Pong Krell and now Rio Durrant are awesome figures as well, real triumphs in design. Love Kit Fisto too because the head mold is so different and again, a truly great representation. Do we really not know what species Yoda is? I never looked it up in detail but it’s quite interesting if we don’t know for certain. Snoke perhaps wasn’t revealed as a species in case it’s referenced in Episode IX. Yoda's species has never been confirmed. Great article! Gran and Ithorian are cool species and the minifigs are amazing! My favorite species is Human. Or is that rasist to say. ;) Okay I like the Ewoks as well. @The Rancor & @ewokswithbricks: I think that's actually true in-canon as well. It's not just that we, the fans don't know, no characters know either. Except Yoda, and presumably Yaddle. Whatever that was about. Just a thought: wasn't the first Asajj Ventress minifigure made before the retcon that said she was Dathomiri? So teeeeeechnically wouldn't her first minifigure still count as a Rattataki? Forgot the George Lucas species. Wait, Snoke isn't just a scarred human?! Oh my goodness, the lore nerds strike! I am one, so I don't mean any disrespect. Great article and list, I had no idea there were so many species represented in Lego form. The novelisation of Star Wars: The Force Awakens and many other materials have confirmed that Supreme Leader Snoke belongs to an unknown alien species. Interesting list. I’d love to see another one of these, but listing various droids, such as the astromechs, protocol droids, battle droids, and super battle droids.